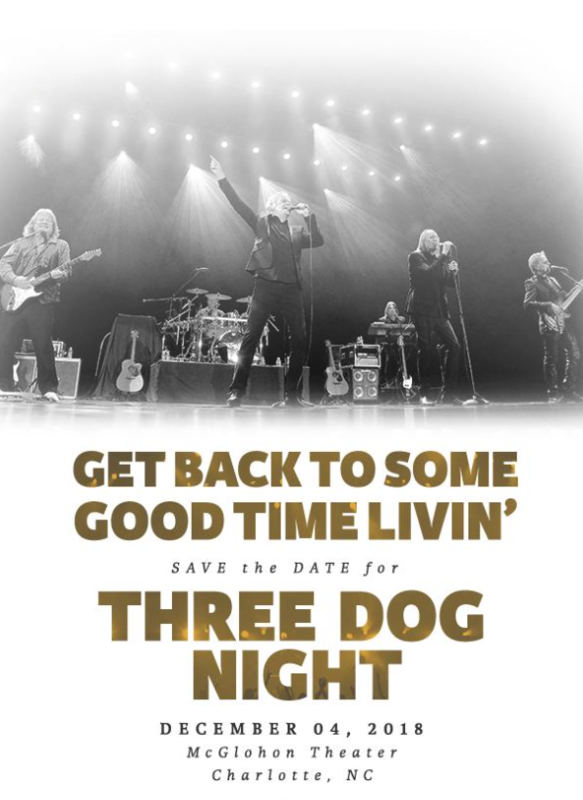 Take a Trip Back in Time with Three Dog Night at the McGlohon Theater on December 4th. Joy to The World, One (is the loneliest number), Mama Told Me Not to Come, Easy to Be Hard, Eli’s Comin‘, Old Fashioned Love Song….American Rock Band Three Dog Night brings its brand of 1970’s Top 40 rock n roll to Charlotte on Tuesday, December 4, 2018 to perform to a small audience of Music with Friends members at the McGlohon Theater. Who Says “That Ain’t the Way to Have Fun”? Music With Friends will end its 2018 season with this final show welcoming the Grammy Award-nominated band that’s been rockin’ for nearly five decades — landing 21 consecutive Top 40 hits and performing them on the road for nearly 50 years. Also less familiar but no less interesting Three Dog Night trivia ~ the band members wrote just a few of their hits, as most of the songs Three Dog Night recorded were written by outside songwriters, notably Randy Newman “Mama Told Me Not to Come”, Harry Nilsson “One”, Paul Williams “An Old Fashioned Love Song”, “Easy to Be Hard” from the musical Hair (my personal favorite), and Hoyt Axton “Joy to the World” + “Never Been to Spain”. Every MWF concert is a wonderful evening of entertainment, which starts off with cocktails and a huge spread of heavy hors d’oeuvres, followed by the performance and an after party. This time the After Party is at 5Church, which is always a fun & fab place to party with friends. If you’re planning to do a lot of partying, which you should (! ), then book the MWF rate at the Dunhill Hotel and make an evening of it. The reservation deadline is November 20th. You can read all about Music With Friends in our articles on past concerts here. As a member of Music With Friends, you are invited to 3 annual performances like this one, along with several other members-only get togethers at some of the QC’s top locales. You can read more about a Music With Friends membership and its privileges here. Or contact Becky Mitchener at bmitchener@musicwithfriends.com or 704-907-1806 for more information. If you want to try Music With Friends out with a single show ticket purchase ($650 per ticket) please contact Becky who can seat you while ticket availabilities last. Email Becky Mitchener at bmitchener@musicwithfriends.com or call 704-907-1806 for more information or to purchase your membership or single ticket today.